This year’s International Primate Day highlighted the suffering of primates in laboratories around the world. USA: The unborn baby monkeys were dosed with ketamine, exposed in the womb, killed, and their brains analysed at the Oregon National Primate Research Center. The researchers did not even mention the trauma of the mothers. UK: At government lab Porton Down, the lungs of marmoset monkeys bled after they were forced to inhale a deadly pathogen for ten minutes. They were then dosed with a drug to try and counteract the effects with animals either dying from the disease or being killed. 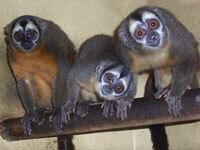 Colombia: Owl monkeys were dragged screaming from the jungle, placed in sacks and taken to a laboratory. In one experiment 18 were injected with malaria infected blood and used to test an experimental vaccine. Donate now and help end the suffering. The monkeys were then trailed to a malaria lab in Colombia – with our team securing footage inside the barren cages. ADI infiltrated Nafovanny in Vietnam filming the macaque monkeys in small, filthy, broken cages – images the huge dealer of monkeys to the USA and UK denied were on their premises – until we proved otherwise. Our team has filmed in monkey dealers and monkey laboratories all over the world.